India’s media has criticised the decision of Tamil Nadu state not to host Indian Premier League (IPL) games with Sri Lankan players, amid anger over Colombo’s rights record. The Indian Premier League said teams taking part were being told of the move. Players from around the world compete in the world’s richest cricket league. Thirteen Sri Lankans are signed up to play in the nine-team Twenty20 tournament, which begins on 3 April. They include Mahela Jayawardene, Muttiah Muralitharan, Lasith Malinga, Tilakratne Dilshan and Ajantha Mendis. In a letter to Prime Minister Manmohan Singh, Tamil Nadu chief minister Jayalalitha said people in Tamil Nadu had been angered by “barbaric acts” against Sri Lankan Tamils. She said that people in Tamil Nadu were disturbed by alleged human rights violations and reported systematic killing of people of Tamil ethnicity in Sri Lanka, adding that if the Sri Lankans played in the state, it would “aggravate an already surcharged atmosphere”. “To drop the Sri Lankan players on this ground is to blatantly discriminate on the basis of nationality and ethnic identity,” The Hindu newspaper said in an editorial headlined “Chauvinism at its worst”. 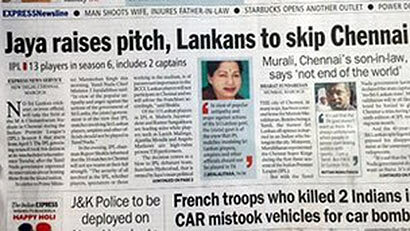 The newspaper also criticised the IPL authorities which, it says, “did more harm than Ms Jayalalitha”. The Times of India said “Tamil Nadu’s politics over the vexed Tamil issue has stumped Sri Lankan cricketers participating in the IPL”. The Indian Express said this was not the first case of “politics spilling over to the sporting arena”. The newspaper said the Tamil Nadu government had not allowed a football team from a Colombo college to train in the state capital, Chennai, last September. And, “more recently, the 20th Asian athletics meet in Chennai ran into rough weather as the Sri Lankans were expected to among the participants”. Sri Lankan cricket star, Muttiah Muralitharan, who is a member of the IPL franchise Chennai Super Kings, told the newspaper that it is “sad the Tamil Nadu government doesn’t want us there”. “It’s always unfortunate when people in power start mixing politics with sports,” he said. The main opposition party in Tamil Nadu withdrew from India’s governing coalition – also in March – over its failure to condemn alleged atrocities against Sri Lankan Tamils.